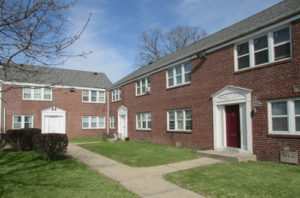 Marcus & Millichap is pleased to announce the sale of Crestbury Apartments – 392 units located in Camden, NJ. Camden, NJ, September 26, 2017 – Marcus & Millichap (NYSE: MMI), a leading commercial real estate investment services firm with offices throughout the United States and Canada, announced the sale of the Crestbury Apartments, a 392-unit multifamily property located in Camden, New Jersey, according to Sean Beuche, regional manager of the firm’s Philadelphia office. The asset sold for $34,450,000 or just under $88,000 per unit. Andrew Townsend, Ridge MacLaren, and Clarke Talone, investment specialists in Marcus & Millichap’s Philadelphia office, had the exclusive listing to market the property on behalf of the seller, Brick, NJ-based Tryko Partners. An affiliate of Lincoln Avenue Capital LLC from New York City, a leading owner and developer of low-income housing properties nationwide, purchased the asset free and clear of debt. In fact, after purchasing Crestbury Apartments in 2013, Tryko Partners invested $3.6 million in capital improvements. This included the incorporation of an innovative, high-tech security initiative in conjunction with the Camden Police Department; a playground; and updated lighting, landscaping and sidewalks. “We are seeing a tremendous amount of interest in well-maintained workforce housing, both market rate and affordable, in South Jersey due to solid economic drivers and its proximity to Philadelphia,” added MacLaren. The 392 apartments are a mixture of one- and two-bedroom units. The Crestbury is situated on over 18 acres at 2552 South 8th Street in Camden, New Jersey. The property is minutes from both the Walt Whitman and Ben Franklin Bridges as well as Cooper Hospital, Campbell’s Soup Headquarters, and the Camden Waterfront.